Yeah, I'd say summer is here. We had a spring clearance yesterday and the first big retail summer sale. 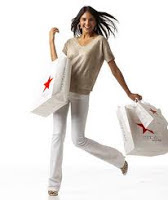 This one comes form Macy's which is offering big discounts throughout every department in the store. Bonus: Spend $99 or more and they will take 20% OFF your total purchase and toss in free shipping to boot (home items are 15% OFF). Just add promo code SUMMER at checkout. Clothing, jewelry, watches, mattresses, bedding, bath essentials, shoes, furniture, and more are all discounted. Then you discount that discount and get FREE shipping with that SUMMER code. Click here to see the discounts at Macy's.